Let me step back onto my soapbox for a moment. When Baatar, Jr. (Todd Haberkorn) forces Varrick (John Michael Higgins) to go back to work on the spirit vine project, Varrick recruits Bolin to help him. Bolin asks if they can get breakfast first. Later, Bolin sheepishly suggests that they work on developing the vine into a clean energy project instead of a weapon. 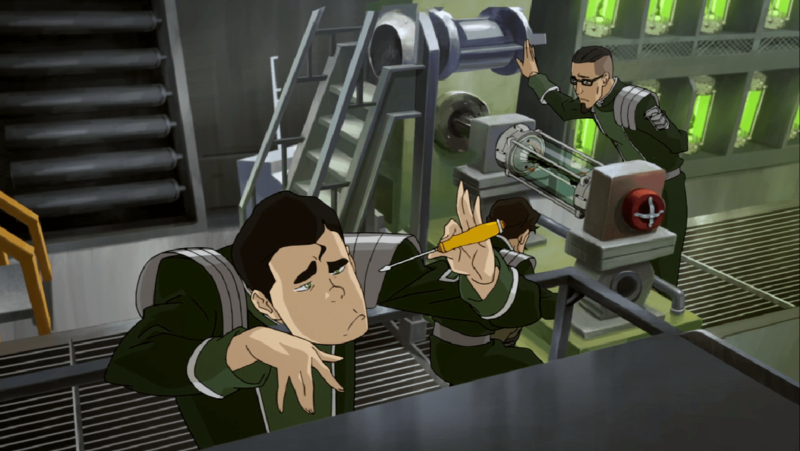 The other characters ignore Bolin’s foolish behavior amid the high stakes. Bolin throws himself and Varrick off of the train and into the earth and the bomb goes off in a massive spirit energy blast that visually evokes a nuclear explosion. We see Baatar Jr. react in horror, then cut back to Bolin burrowing safely out of the earth with Varrick in tow. The young earthbender is still believably angry. Had Bolin attempted to charm his way out of the predicament, as he is wont to do, the scene would have felt disingenuous. Instead, he responds like a human might. Last week I’d all but lost hope for his character’s development, but “The Battle of Zaofu” makes me believe that there is still a glimmer of hope for his growth. One of my first impressions of Book Four was that it would follow a similar narrative arc to The Dark Knight Rises, and “The Battle of Zaofu” supports that notion. The episode underlines parallels between the two storylines. Most importantly, this final season of The Legend of Korra and Christopher Nolan’s trilogy capper both focus on a hero struggling to re-assume their mantle. When Korra (Janet Varney) fights Kuvira (Zelda Williams) one-on-one, I couldn’t help but recall Batman’s initial fight with Bane. Both Korra and Bruce Wayne believe that their built-up anger alone will be enough to help them triumph, underestimating their enemy’s potential. Bane’s incredible strength and painkiller-pumping mask allows him to continue taking Batman’s punches, and with her bending prowess, Kuvira is able to dodge and deflect most of Korra’s attacks. Warning: The following paragraphs contain minor spoilers for The Dark Knight Rises. These duels end similarly. Bane breaks the bat, and Kuvira takes advantage of Korra’s resurfacing spiritual burden. Korra finally enters the Avatar State as she overtakes Kuvira and knocks her down. But when Korra prepares to deal the final blow, she suddenly sees Phantom Korra’s face appear on Kuvira’s body. I was shocked to see the military leader look up at Korra with glowing eyes. 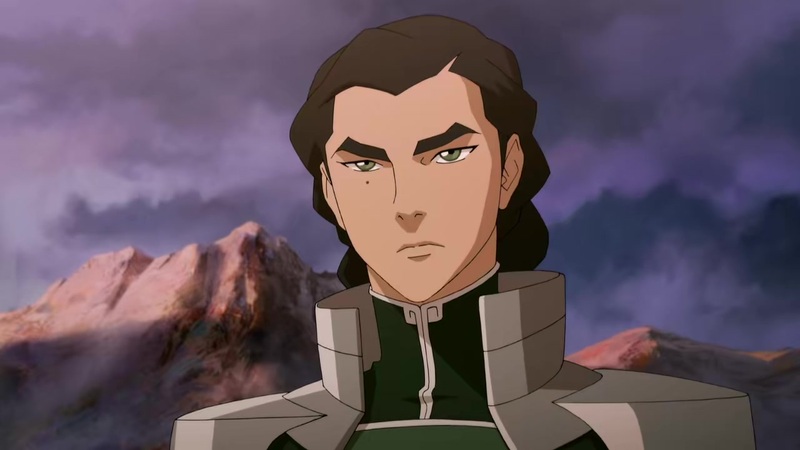 At first, it seemed to indicate a mythos-busting revelation that Kuvira also has access to the Avatar State. But a callback to Phantom Korra is even more jarring. I was upset to see that Korra’s healing in the swamp didn’t totally resolve her issues, but I don’t think this reveal was a misstep for the writers. Rather, it makes an already grim battle scene even more disturbing. Jinora (Kiernan Shipka) and Opal (Alyson Stoner) watch helpless and bewildered from the sidelines. They immediately voice the audience’s questions. If Korra bent the Red Lotus venom out of her body, why is she still unable to fully control the Avatar State? This scene makes clear that Korra still has psychological demons to confront. With seven episodes remaining, the writers have ample time to return to a deeper examination of Korra’s headspace. Hopefully they will take advantage of the opportunity to emphasize her intrapersonal struggle. Like The Dark Knight Rises, Book Four has left its protagonist battered just before the middle of the story. “The Battle of Zaofu” reminds Korra that she clearly still has a long way to go before she’s ready to save anybody. By the same token, this confrontation underlines how dangerous Kuvira is in hand-to-hand combat. This chapter’s bleak ending indicates that Korra had best get back to work quickly. Atop the city steps, Kuvira claims Zaofu for the Earth Empire as Suyin (Anne Heche) and her sons watch trapped in metal body cages. 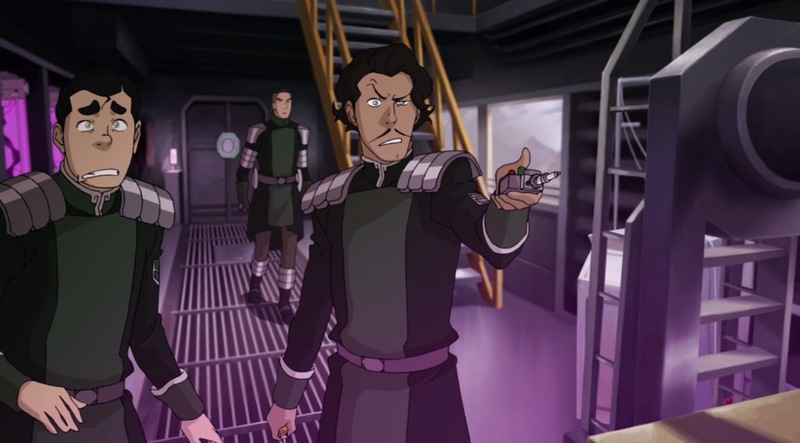 Baatar Jr. arrests his own father for refusing to bow to Kuvira. These images are horrifying; The Great Uniter has divided the once-indomitable Beifong family. Kuvira recruits Zhu Li (Stephanie Sheh) to help Baatar Jr. resume the spirit weapon project. Zhu Li accepts the task with an ominous look in her eye. I’m still hesitant to assume she isn’t planning a grand scheme of her own, but we’ll have to wait and see. For now, I’m terrified by the thought of what Kuvira will do with “the most powerful weapon the world has ever seen,” because I have a feeling she’s more than ready to commence primary ignition.